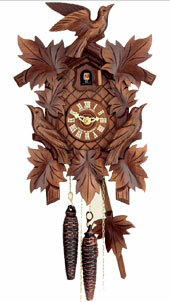 This traditional style cuckoo clock is made by Hubert Herr out of linden wood and stained in walnut color. 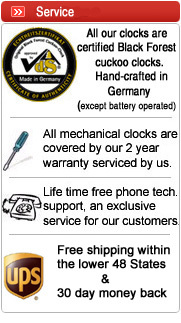 It measures 12 inches and features a night shutoff. Beautiful handcarved leaves and bird on top. 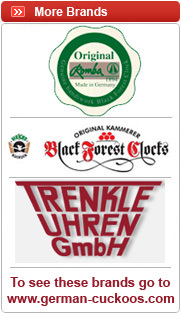 Hubert Herr is the only company, who makes it's own clock cases, carvings and movements. This clock features an extra thick solid wood case, for extra stability.